Our new documentary film is now aivalable! 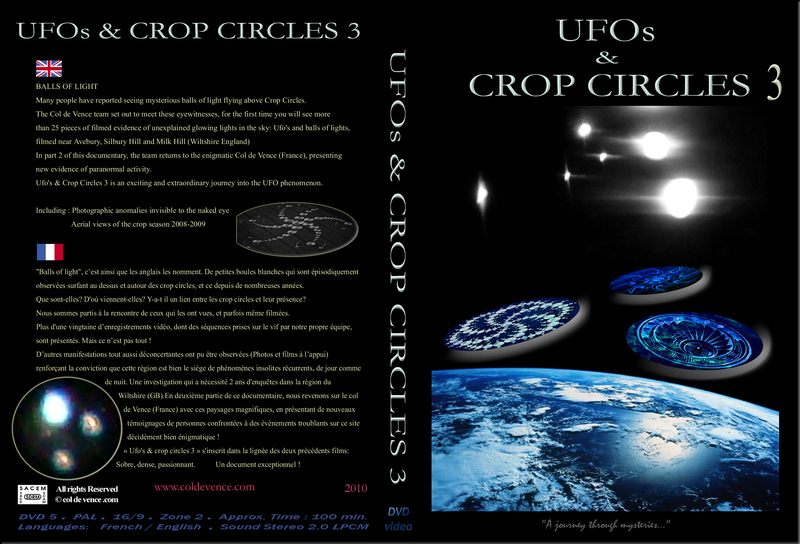 "UFOs & Crop circles 3"
Technical characteristics: DVD 5. Pal 16/9 - zone 2. stéréo. audio tracks: French version / English version. Many people have reported seeing mysterious balls of light flying above crop circles. The Col de Vence team set out to meet these eyeswitnesses. For the first time, you will see more than 25 pieces of filmed evidence of unexplained glowing lights in the sky: Ufo’s and balls of light, filmed near Averbury, Silbury hill and Milk hill (Wiltshire, England). In part 2 of this documentary, the team returns to the enigmatic col de Vence (France), presenting new evidence of paranormal activity. Ufo’s & crop circle 3 is an exciting and extraordinary journey into the Ufo phenemon. Including: photograpfic anomalies invisible to the nacked eye and aerial views of the crop season 2008-2009. 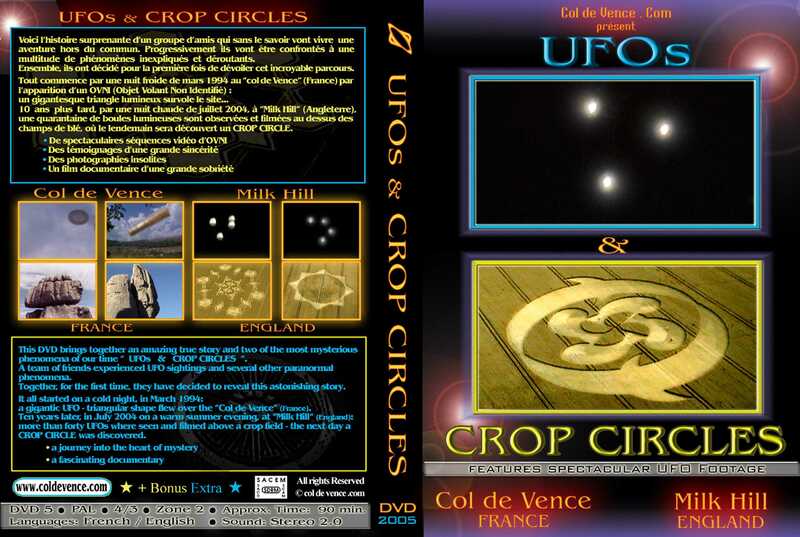 "UFOs & Crop circles 2"
DVD Format - Pal 4/3 - zone: all - Stéréo. 3 audio tracks : Original version / English version / French version. This documentary explores the mysterious worlds of UFOs, crop circles and paranormal. The « col de Vence.com » team set out to meet people involved in UFOs phenomenon and crop circles research, in France and England. Featuring more than 25 interviews from experts around the world, this documentary film presents new UFO footage never published on video and exclusive documents. The col de Vence in the southeast of France and the Milk Hill region in the southwest of England are two parts of the world haunted by mysterious anomalies. The team investigates in these two areas where strange events are still happening. "UFOs & Crop Circles 1" (october 2005). 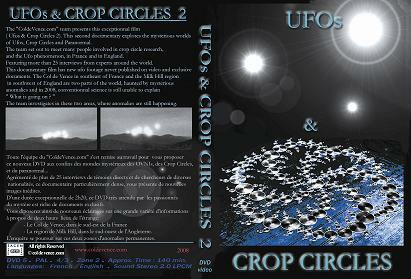 This DVD brings together an amazing true story and two of the most mysterious phenomena of our time "UFOs & Crop Circles". A team of friends experienced UFO sightings and several other paranormal phenomena. Together, for the first time, they have decided to reveal this astonishing story. A gigantic UFO triangular shape flew over the "col de Vnece" (France). Ten years later, in july 2004 on a warm summer evening, at "Milk Hill" (England), more than forty UFOs where seen and filmed above a crop field. The next day a Crop Circle was discovered. (Specify your choice in the order. For example: Vol 1 + Vol 2 or Vol 1+ Vol 3 or Vol 2 + Vol 3). (Pack of three DVDs, almost 6 hours of documentary!). Methods of payment: Check payable to "associaton Col de Vence.com" or in cash (accepted currencies: pound). Methods of payment: Check payable to "associaton Col de Vence.com" or in cash (accepted currencies: Euro).